The Preferred Enemy: LVO Complete and Totally Awesome! 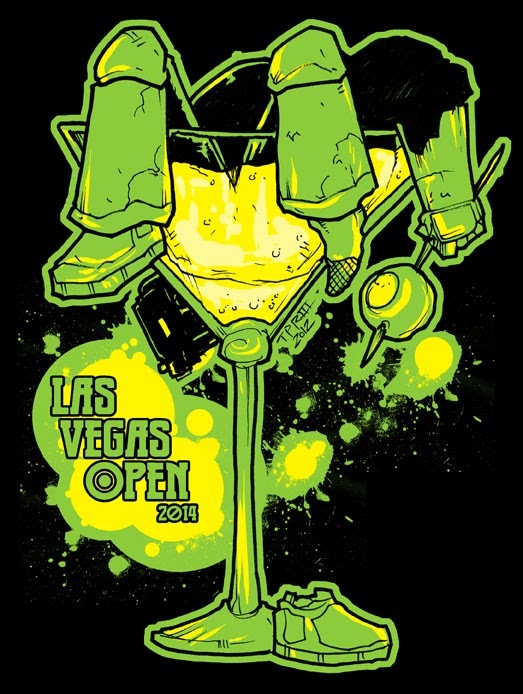 So this last weekend was the Las Vegas Open and man did I have a great time. My wife decided shortly before the trip to come out for this, plus Anthony's wife went along as well, so that was pretty nice. They got to walk around and did some shopping in the day while we were free to game. Then Friday evening we were able to have a great dinner and hang out, and Saturday night we had to ourselves for a date night. We had dinner and went the the Cirq show Ka and that was a lot of fun. Of course the 40k was where it was at and even though my record of 3-2 is modest I had a ton of fun. There was great generals and beer and dice so it is hard to go really wrong from there. Here is the briefest of recaps of the games I played with my Grav Bike army. Game 1 was Dawson and his Orks w/ IG. I think this potentially is a good army as you can fill the holes of orks w/ IG and visa versa so I was interested to see how it worked. It probably is a fine list but the matchup wasn't really in Dawson's favor and I was able to do well. Game 2 was against Mike B from Reno who beat my fanny good at BAO last year, and has won plenty of events himself. Instead of CSM this time he brought Eldar with 3 Wraithknights! This is the kind of matchup I was looking for and by turn 3 had killed the Knights off. Mike fought me the rest of the time to make me work for it but it was a bit much to come back from. Game 3 was against Jim (Jy2 on Dakka) and his Necrons. I've probalby played Jim 4 or 5 times locally and he always starts with a 'I'm not sure I can beat this list' and then beats me. Most of the games are close, and this was no different. This was actually a bit of a re-match from 2 years ago at the Golden Throne where his Necrons beat my bikes. Of course the bikes are a lot better and I think I played well. However about midway though Jim observed 'your dice are giving up on you' and they had. I was in combat with the wraiths to avoid being shot, but I was failing saves and he was making his so what can you do. I lost but it was 6-5 so you can't be too unhappy. Day 2 I'm feeling rested but it was certainly a bit harder to get excited after a long day and night, but I knew that technically 1 or 2 people with one loss could make the finals. Since I did well the first two games and just barely lost to Jim technically I felt there was a chance however slim. So Game 4 I pull Steve S who has won lots of tournaments in CA. He's running an almost identical list. He's saved points on Anti Air by running 2x2 Hyperious launchers instead of Storm Talons. He's used those points and the points from my scouts to add an upgraded command squad. He's also running a libby instead of Khan. This game was a bit back and forth the first turn or two, then Steve's dice just check out and took a break. I mowed through his command squad and he failed some LD and his army was on the ropes. Still he kept fighting and would have kept me to a close win if the game ended but it went on and thus secured me a big victory. I end up on table 8 so I know this is playing for the last finals spot. At first they put me up against Israel's Tau and he's a great player but I'm chomping at the bit to go after all those Riptides. Not that it was auto win by any means because he's a great general, but ya... I was feeling good. Alas there was an error so I get to instead play Nick (Darkwynn) and his Eldar. So you know, only one of the most successful 40k generals ever, no biggie. It was funny because it was the Feast Invitational winner vs the Feast Open winner. Unfortunately I only had two choices against his army (go after him or retreat a few turns) and I chose the wrong one (go after him). He basically tabled me over 4 turns and we called it when I had exhausted every angle I could to score/deny points. I didn't feel like I gave a very good account of my generalship but we laughed the whole time. I also feel like the experience from that game would aide me in any future rematch to make the game be a lot closer if nothing else. So I dropped to 3-2 but played some really great guys and the losses didn't really damage my ego or anything so that is always nice. Day 3 was the doubles and I played with Jason and his Eldar and we had just thrown a list together of what we had brought. We managed to win our first two games, but unfortunately Jason had to run to the airport to leave. Luckily our friend Grant was able to step in and Jason left us his models to play on Table 1 for game 3. We ended up losing to end up in 3rd overall but it was a fun game where we lol'd the whole time so, again, nothing wrong with that. Of course the most exciting news is that I ended up winning the raffle army. This thing is pretty amazing. When you think about all of the models, bases, and case that is probably $1000 right there. Then the pro paint job is probably another $1000. So while I don't normally gamble in Vegas that $10 investment in raffle tickets totally paid off for me! TOTALLY AMAZING. There is just one little detail that, and keep in mind I'm NOT complaining, that keeps this win from just the absolute freaking perfect thing. NOT COMPLAINING, but yes I already do have a pretty decent size Tau(dar) army. This really just adds a few big models (2nd riptide, 3rd Broadside, Wraithnight) from what I could currently run right now. The big thing is how beautiful the army really is because it is AMAZING. It is also probably pretty darn good at 1750. You could run all those models for 2000 pts if you were so motivated or didn't want to add other (ie pay for more) models. I'm not sure 200 pts of drones is the best option... but you COULD do it should you choose. So I'm not entirely sure what to do. I could try to sell or trade this new army away. Not that I 'need' the money, but it would be nice to get my Black Dragons pro painted to this level so that could fund/subsidize that endeavor. I could also just sell my other snow Taudar away and use that money to get a few upgrades for this army and continue my plan on painting the Black Dragons myself. Either way the LVO was a blast and I'll certainly be going every year I can. It also has got me hungry for games and events, which is always a bit tricky to fit in the schedule but I look forward to getting to those that I can! I can totally see how that would put a dampener on the excitement of winning. Frankly I like the looks of the army you already had over the one that you won, no offense to the boys down at FLG, they do amazing work. But I'm a one army kind of guy so my opinion isn't exactly the best. Definitely cooler than simply winning the cash equivalent though, even if it's a bit more inconvenient. Definitely at least get some photos and games in and create some memories before getting rid of either army! Heh, ya I'm certainly not complaining at all. Options are always nice. 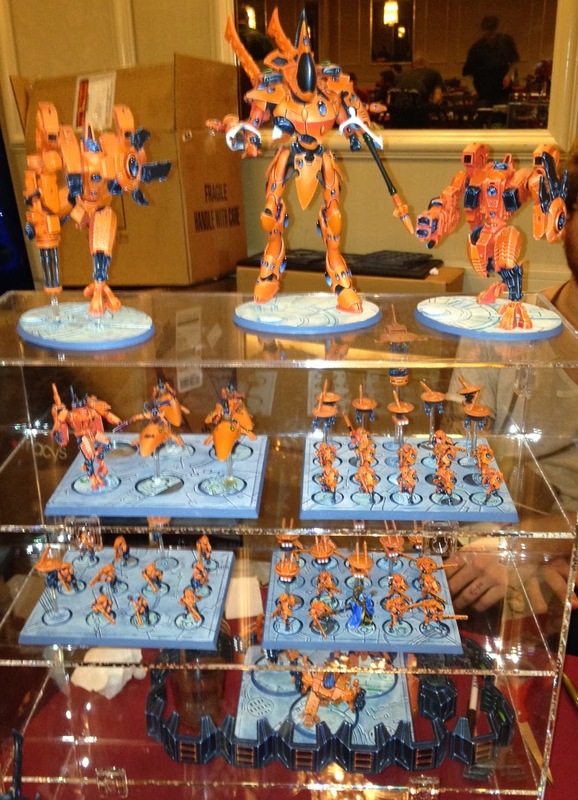 My buddy Anthony had used my Tau at the LVO and I think I'll give a huge friend discount over to him for it and that way it is still around to enjoy and probably paint future bits for him!